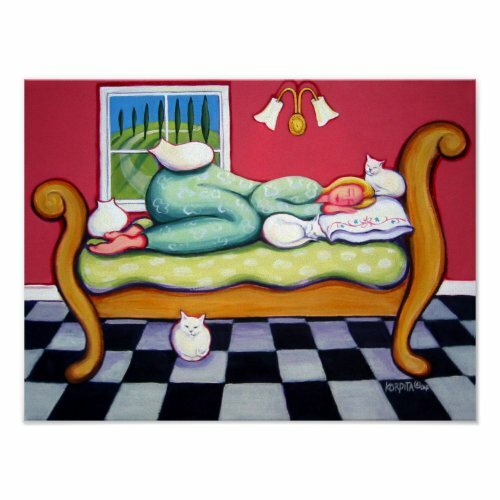 A beautiful, cute, lovely painting by Rebecca Stringer Korpita featuring a woman somewhere in Tuscany blissfully napping on a lazy afternoon, with her five white cats. Wonderful cat art for cat lovers, featured here on a customizable canvas poster. You can get the poster framed, when ordering! Beautiful art for your walls. Great for home decor. Makes a wonderful, beautiful, awesome gift for pet lovers, cat owners, feline lovers, on birthday, mothers day, or any regular day.